In The Perfect Sleep--another recently released dark opus of betrayal, family secrets, blood, and sadistic characters that felt like they were the product of an unholy union between classic film noir and modern day horror-- the plot, much like that of Nobel Son was so tremendously complicated that even the most casual viewer would feel as though they needed a pad of paper, knowledge of shorthand and a pen to keep 'em all straight. Yet the main difference between the two in retrospect is simple-- since I finally gave up trying to makes sense of anything in the case of The Perfect Sleep which was so confoundedly pretentious and ludicrous that the ability of its cast to deliver bloated Shakespearean lines with a straight face was the only thing that kept me watching. Okay, well to be fair-- in addition obviously to professional obligation-- it was a train wreck of such ghastly proportions that part of the bizarre fascination came from sheer bewildered amusement. However, when faced with the admittedly equally full of itself Nobel Son-- the tone perfectly suits that of its egomaniacal Nobel prize winning chemist lead Dr. Eli Michaelson (a deliciously wicked Alan Rickman) in the mesmerizingly sharp script penned by Marilyn Hotchkiss' Ballroom Dancing and Charm School and Bottle Shock husband and wife team Jody Slavin and Randall Miller. For in Nobel Son, they trade in their previous instinct for nostalgia and audience pleasing sentimentality with the darkest of explorations in a film wrought with an emphasis on the definition of insanity, cannibalism, suicide, infidelity, kidnapping, and revenge. And while the gruesome opening minutes may find some viewers reaching for the eject button and indeed, it's only the first of several scenes that will make you cringe-- if you stick with the devious work, you may realize as I did in sheer surprise that as twisted and sinister as it was in all of its forever changing glory, I was engrossed throughout its entire running time. While the plot of The Perfect Sleep can't be summed up with any amount of words in the English language since I'm not sure even those involved knew just what the hell was going on-- everything about Nobel Son makes perfectly logical (yet unsettling and disturbing) sense, even when it threatens to journey several twists past our suspension of disbelief. Yet, still I hesitate to reveal much about the storyline and was dismayed by the amount of spoilers readily available in reviews around the web so surf with caution even in publications like Variety. In a nutshell, it centers on the insufferably smug academic-gone-wild Eli Michaelson (Rickman, of course!) who constantly reminds everyone he comes into contact with of their intellectual inferiority. Endlessly unfaithful to the tune to his early introduction via shagging a grad student he has no qualms about giving a D-- Eli is the last person the world should reward for his rude behavior with a Nobel Prize. Fond of publicly humiliating his colleagues and family-- Eli loves to reduce those around him to nothing including the PhD candidate son (Byran Greenberg) he gives a thirty-five dollar a week allowance to since he disapproves of his thesis topic of cannibalism and reverence for Game Boy as well as making jokes out of his brainy MD wife (Mary Steenburgen) whose expertise regarding insanity vs. sanity finds her consulting with local and national law enforcement on a regular basis. Yet, as the film ironically concedes-- the world of academics doesn't actually care about a person's private life-- just the professional accomplishments and contributions to his field so Eli and his wife Sarah venture to Sweden for him to bask in the honor and two million dollar prize. However, when their son fails to return home from a date with his unstable coffeehouse poet crush City Hall (Dollhouse and Bottle Shock's Eliza Dushku, again using her dry wit and sexuality as currency), they find themselves in for one hell of a twist. As-- instead of a telegram or congratulatory letter from a well-wisher-- they receive a delivery of a human thumb that may indeed be that of their son Barkley. Returning home from a passionate night with City Hall, Barkley is clubbed in the head and held for the Nobel prize money by the calculating "autodidact" Thaddeus James (Shawn Hatsoy). Yet in lieu of taking us down the familiar terrain of a hostage film, Slavin and Miller's calculating screenplay continues to leave us thoroughly baffled-- complete with the sharp editing that only hints at future twists to come by presenting us with various pieces of the puzzle that only finally make sense once the end credits roll. While we understand that two million dollars is reason enough for a kidnap and ransom with an eerie opportunist like Thaddeus-- soon it's revealed that Eli's unscrupulous behavior in the past has finally caught up to him as Hatsoy's Thaddeus drops a bombshell on Barkley regarding his more revenge fueled motive. Moving from the idea of two young men working together to put one over on the wicked academic Scrooge-- the film's subsequent acts switch up the motive repeatedly as other characters come out of the woodwork (some in new ways than we'd previously been shown) along with the main cast's ability to easily get in touch with their darkest sides when prompted with the film's exceptionally heightened circumstances. Although Barkley is far from an ideal "hero" since his obsession with cannibalism is enough to make one's stomach turn right off the bat-- and Dushku and Rickman are used more as "types" (as is Danny De Vito who plays their obsessive compulsive neighbor) than full three-dimensional characters-- Steenburgen is given her best material in years. As a woman who-- despite our early poor judgment of her for tolerating life with Eli-- proceeds to become a tough heroine in her own right by cursing out a reporter with a gun blazing to stay off her lawn and setting off sparks with the detective who's terribly sweet on her, Bill Pullman's Max Mariner, Steenburgen's instantly feminine and genteel demeanor make her especially fascinating to watch throughout. Despite this, Nobel Son isn't for everyone and I found myself incredibly glad I'd missed the press screening that night back in its December theatrical release and had the ability to view it at home in the a.m. where I could pause and think about things without being held captive at night in a dark theatre. Moreover, as I write this, I realize that I have no idea when I'd watch it again other than to perhaps fully appreciate the plot that unfolds after enough time has passed and I've blocked certain images from mind. Still, aside from some situations that are designed specifically to repulse-- as in the gruesome opener, one extremely tasteless payoff involving Barkley's thesis topic near the ending, and sleazy satires on psychotically indulgent coffeehouse poetry that grows old fast-- director Randall Miller's movie will remind you of a much darker version of Christopher Nolan's The Prestige blended together with Joel Coen's Fargo with its ultimate evolution into a macabre, morose, and morally bankrupt magic trick. And centering on a family so bizarre they'd make Bud Cort's Harold from the Hal Ashby classic Harold and Maude look normal by comparison-- while you may not know who to root for or why you find yourself continuing to watch-- at least the complexity of this screenplay (unlike the ultimately faux intelligence of Perfect Sleep) makes it downright impossible to guess what's coming from one scene to the next. 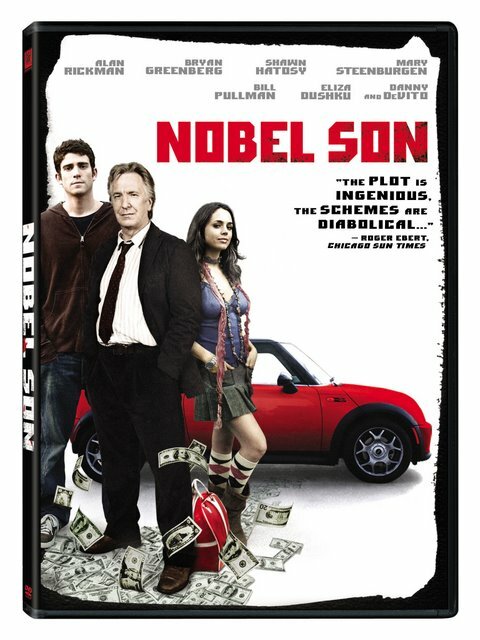 Therefore, Nobel Son is all the more successful as a feature film because it remains logical despite its celebration of chaotic craziness. Likewise, it's especially rewarding for offering Steenburgen a wonderful follow-up role to her surprisingly deft comedic turn in Stepbrothers with yet another creatively written gem that goes against the grain of most parts envisioned for women over the age of forty.